Old horror franchises never die—they just get the Hell rebooted out of them. It is time to go back to the Texas Chainsaw Massacre well yet again. This time, we get the origin story of the nastiest and most sadistic of the clan. If you are wondering how this squares with Texas Chainsaw Massacre: The Beginning, released way back in 2006, I’m afraid you are on your own when it comes to questions of canonical continuity. The title character is still a fresh-faced kid, but he will change during the course of Alexandre Bustillo & Julien Maury’s Leatherface (trailer here), which opens today nationwide. The knuckle-dragging Sawyer family regularly gets away with murder, but killing the daughter of Texas Ranger Hal Hartman is pushing the envelope, even for them. Believing in a Roy Moore Biblical kind of justice, Hartman whisks away Jed Sawyer, the youngest of the brood, using a dubious order of protection. Actually, a legitimate case could be made Jed needs protecting, if he were not dumped into a nightmarish bedlam style looney bin. About a decade or so later, young Jed is now known by his alias, whatever that might be. Murderous matriarch Verna Sawyer is still desperate to regain custody, but Hartman and the hospital director continue to stymie her. However, Jed will soon be leaving as one of a small group of escaping inmates who take the decent, well-intentioned Nurse Lizzy hostage. Seth M. Sherwood’s screenplay wants to keep us guessing as to which one will become Leatherface, but it is pretty easy to guess on the basis of relative screen time. With the late Tobe Hooper only credited as an executive producer, Leatherface the movie has just one thing going for it—Stephen Dorff going all in as Hartman. When he is yelling and glaring and chewing the scenery, the movie actually starts to generate a little bit of fun. Still, it is frustrating to see his character make the same dumb horror movie mistakes. Seriously, he is a Texas Ranger. When stalking murderous backcountry folk, he should shoot first and keep shooting. Talking can wait. Independent Spirit Award winner Lilli Taylor looks weirdly out of place as Verna Sawyer, but she does her best to snarl and hiss, Vanessa Grasse is way too shy and retiring to make us believe she could be a “final girl,” but we can’t help feeling for her. Everyone else is basically a caricature, a cliché, or an idiot with dubious motivation. 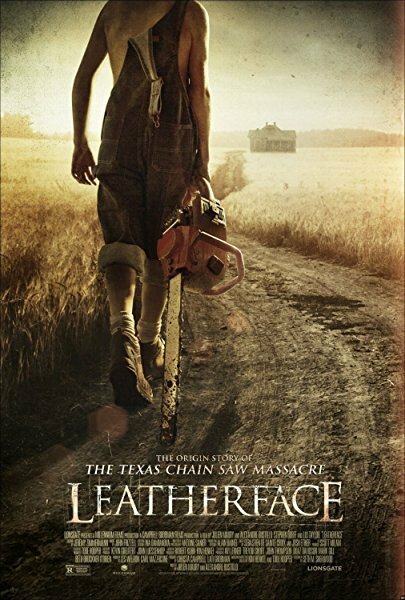 Although there are far fewer chainsaws in Leatherface than most Texas Chainsaw Massacre franchise installments, this is still a very brutal movie. Yet, it fails at what is supposedly its primary mission. None of the bloody mayhem we see convincingly explains how Jed the ward of the state becomes the savage Leatherface. Frankly, the transition is abrupt and baffling. Not recommended, Leatherface opens today (10/20) in New York, at the AMC Empire.